When Labour were elected in 1997 they more or less stuck to Tory spending plans for an election. They did this to build up their reputation for fiscal responsibility with financial markets. Everything I’ve just written is wrong. In reality from 1997-2001 Labour spent more than the Tories would have, just as they did subsequently, but they did it off balance sheet. 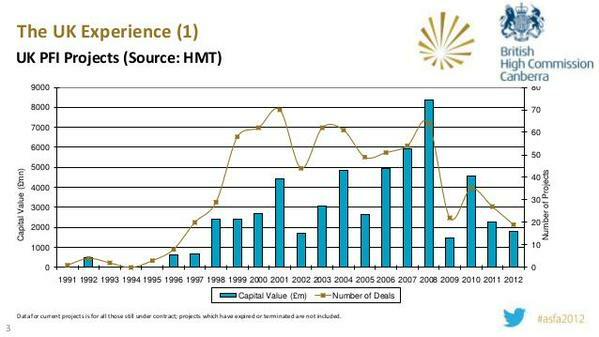 You can see the explosion of PFI deals from 1998 onwards. That is how Labour kept to their spending plans and built and refurbished loads of hospitals. When it comes to fiscal responsibility you paper balance sheet doesn’t really matter, it’s your real future liability and assets that matter. Or at least that’s true in finance. What really happened is that financiers knew that the British state needed to invest in infrastructure and were happy to lend Labour money. Labour could have got this money on normal sovereign rates but they were restricted by the press and by public opinion. A similar thing is playing out with the difference between Labour and Tory spending plans for the 2015 election. Labour are promising to be fiscally responsible but to borrow for investment. In reality there’s no clear line between current spending and investment spending. Would tens of billions of pounds spent on effective mental health care pay reduce days lost to work and pay for itself and more? Would improved child care allow more people into work and pay for itself and more? Is repairing roads that are heavily congested really a valuable investment? Just like in 1997, 2015 Labour are dancing to a tune that only exists in the public and press’s heads. It will probably end up with things better than if the Tories were in but worse than if they didn’t have to pander to nonsense paranoia about the national credit card. I expect to be writing this post in 2035 too so don’t expect this to change any time soon. One of the problems with the world is a shortage of safe assets, places you can put your money and come back to it later. It sounds simple but if you have lots of money then it starts to get difficult. You can see this shortage in people paying negative rates to borrow money, there’s such a lack of safety that people will lend some states money and be happy when they don’t quite get it all back. Wealth being kept safely is very useful service all round. People want to borrow money cheaply and people want safe investments. Good times all round. At the moment there’s a global shortage but that problem is soluble even if we are obsessed with deficit reduction we don’t have to be. But what about crooks? Crooks can be very rich, in places where property is less safe than in the UK they can be very rich indeed. But they have a problem, the same weak institutions that helped them get rich – fiddle a procurement here, expropriate a village there etc – means they need to find safe assets to purchase. You can, presumably, see it in the chart above, with London housing being bought by shell corporations with final owners unclear. You can see it in the uninsured safety deposit boxes cleared last week in what I think has to be called a “daring raid.” Swiss watches are very expensive, but it does help you move £100,000s across borders with the minimum of hassle. I’ve never seen a £50 note, but they are easier to store than 20s, and an awful lot of them are used that way. None of these are as safe as Swiss bonds but they all offer varying degrees of safety transformation. I don’t know what impact this has on a broad level. The super prime London properties targeted may as well be in another country for all the effect they have on me but I do wonder how. It might be annoying for the Bank of England is a big chunk of the money supply sits unused but they can adjust to take this into account. Crooks are, presumably, more ruthless than even investment bankers so with a generalised shortage of safe assets it seems possible that more and more safe assets (the glue of the financial world) will be owned by worse and worse people. What effect this will have I don’t know but it doesn’t seem like a terribly good situation. No conclusion to this post. I’m just going to stop writing now. A thought occurs to me, one for here rather than Medium. Given that journalism is so dominated by Oxford and Cambridge educated, private school white people (to a greater degree than average, not totally of course, normal disclaimers apply) it is helping social mobility. The people I know in journalism are very smart people who are earning a pitiful amount in an industry destined to terminal decline. Its entirely possible people entering journalism today could be earning thousands of pounds a year more (and on a trajectory to earn tens of thousands of pounds more) but they’re not. This downward mobility, and we normally measure mobility in hard cash, is in some ways good for society. Maybe if we pay attention to happiness economics these people are still getting a good deal. Journalism is a job with great intrinsic rewards. Women, people of colour, poor people still find it difficult to enter journalism, so perhaps it isn’t so good for society. In either case, I salute young journalists commitment to doing work that makes them happy and jumping on the downwards scissor of social mobility. Hello, not dead, just tweeting. I’ve done a couple of pieces on Medium, which is a lovely site to write on. Not going to close this blog, but will try and use this more for scrappier stuff that’s not meant to look polished and for stuff too long for twitter. Last week I took issue with Dan Hannan’s terrible history. It really was dreadful and I recommend you read this post. It shows the danger of reading your ideology back into history rather than letting the sources tell you what really happened. Tonight I wrote about the Tory’s doomed planned to weaponise Ed Miliband and invented the phrase “Begging the Miliband” for the tendency to presume Miliband’s unpopularity is innate, not state dependent. It’s here. Weirdly Phil had the same idea, must mean we’re right. I wrote it be fore the bizarre revelations that Ed Miliband was dating Stephanie Flanders for ages…I believe this is meant to make him look bad, but it just makes him look cool… Even after all this time I still don’t think the Tories really get sleaze.